CLICK HERE to download the sample chapter "e;Child Carriers"e; from Babes In The Woods* Offers a fresh, modern approach to hiking and camping with kids* Tips to make family outdoor trips less work and worry* Addresses concern about "e;nature deficit disorder"e; in childrenThere's a lot of information out there about introducing school-age kids to the outdoors, but what about babies… and toddlers? Author Jennifer Aist bridges that gap and shares her tried and tested advice for active new parents. 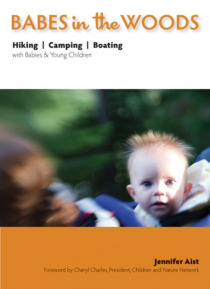 Babes in the Woods introduces outdoorsy moms and dads to the joy and vigor of taking babies and toddlers into the woods at a very early age. Well-organized chapters offer functional solutions for appropriate gear, clothing, and food, nature games to play, and tips on potty breaks and sleeping outdoors-but most importantly, Aist explores all the reasons why introducing even the youngest of children to wilderness experiences is healthy, rewarding, and fun.Whether planning a short day hike, a car camping trip, a base camp adventure, or a backpacking excursion, Aist covers every season and climate, while confirming that babies are well-suited for the mountains, the water, and the adventures that lie beyond.